Andy Keller reminded that there are still shifts unfilled for the Irish Festival next weekend. Please consider filling one of the open shifts. Bonnie Coley-Malir offered to help sign up anyone who is interested in volunteering. Please email Bonnie at bcoleymalir@yahoo.com. Dave Williamson reminded everyone that there is an upcoming Veterans Honor Flight on October 2nd with an invitation to fly World War 2, Korean War and Vietnam Veterans to our nation’s capital to visit the monuments honoring their service to our country. Information and registration can be linked to from the link on our club’s website. 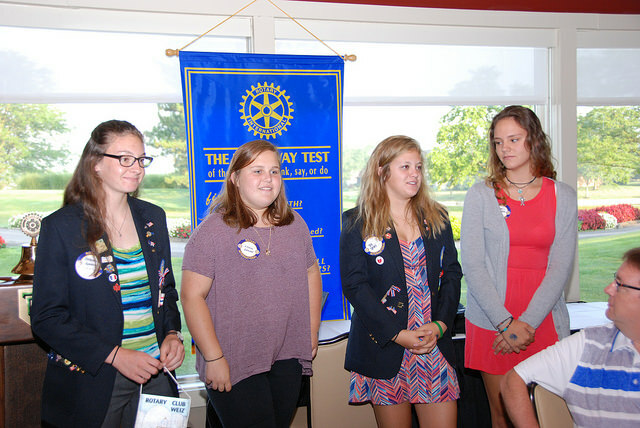 Steve Osbourne introduced four young women who participated this in the Youth Exchange that Dublin AM has sponsored. The Spears sisters introduced their exchange “sisters”, Antonia from Austria and Elena from Barcelona. Antonia and Elena have enjoyed their time so far in Dublin with the Spears family and have visited Niagra Falls, Clipper and Crew games, a performance of Tecumseh, Cedar Point and the State Fair. 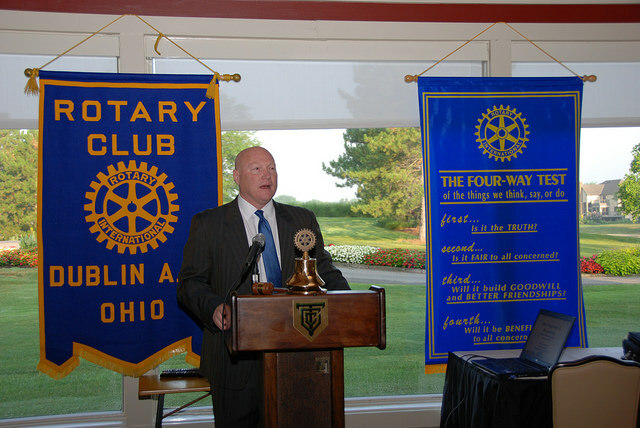 Martin Golden, District Director from the U.S. Small Business Administration, was our guest speaker. The SBA was formed by President Eisenhower in 1953, and it has been elevated to cabinet-level status to reflect the importance of small businesses in driving our country’s economy. While the agency has just 1,500 employees, it’s supported more than 28 million small businesses. The categorization and definition of “small business” varies by industry, but roughly any company with less than 500 employees is in this classification. The SBA does not lend money but, instead, guarantees loans made by banks to small businesses. A variety of different loan options exist, some of which include SBA service fees. Those service fees allow the loan guarantees to not require taxpayer subsidization. Loans of up to $5M can be obtained at Prime + 2.75% up to 6% and loans under $150K can be obtained with no fees. There are also options for Fixed Asset Loans at higher amounts for manufacturing, heavy equipment, real-estate, etc. which can be obtained with requirements for job creation and retention. Micro-loans are available at higher interest rates than be used for a very wide variety of small business needs, which is an attractive option to consider instead of credit card use. Marty noted that Huntington Bank is the top lender of small business loans in Ohio. Marty noted that the lending guarantees and loan options are only a portion of the SBA’s responsibility. The SBA also runs a contracting business development program which enables qualifying small businesses to participate in the Federal Government’s $90B worth of product and service purchasing. These programs ensure that Minority, Disadvantaged, Veteran owned and other qualifying businesses act as suppliers to our government. The SBA also does a considerable amount of Counseling and Education to small business owners and entrepreneurs.